Plain-text file notepad with markdown support and ownCloud integration. 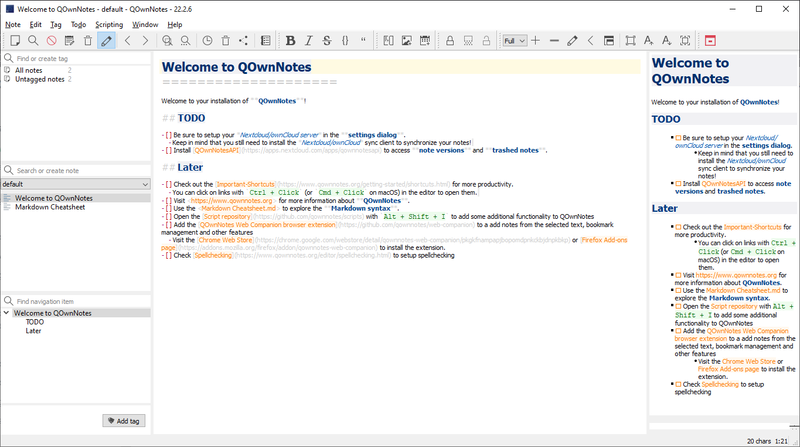 QOwnNotes is the open source (GPL) plain-text file notepad with markdown support and todo list manager for GNU/Linux, Mac OS X and Windows by Patrizio Bekerle (pbek on GitHub and IRC), that (optionally) works together with the notes application of ownCloud or Nextcloud. You own your own notes! All notes are stored as plain-text files on your desktop computer. Sync them over devices (desktop &amp; mobile) with your ownCloud or Nextcloud sync client. Use ownCloud Notes to edit your notes in the web. So you are able to write down your thoughts with QOwnNotes and edit or search for them later from your mobile device (like with CloudNotes) or the ownCloud / Nextcloud web-services. The notes are stored as plain text files and you can sync them with your ownCloud or Nextcloud sync client. Of course other software, like Dropbox, Syncthing, Seafile or BitTorrent Sync can be used too. I like the concept of having notes accessible in plain text files, like it is done in the ownCloud notes app, to gain a maximum of freedom, but I was not able to find a decent desktop note taking tool or a text editor, that handles them well in conjunction with ownCloud or Nextcloud. Out of this need QOwnNotes was born. 699 1,827 Patrizio Bekerle <img src="https://www.oldergeeks.com/downloads/gallery/thumbs/QOwnNotes1_th.png"border="0"> Nov 30, 2018 - 10:51 18.12.0 30.05MB ZIP , out of 4 Votes.